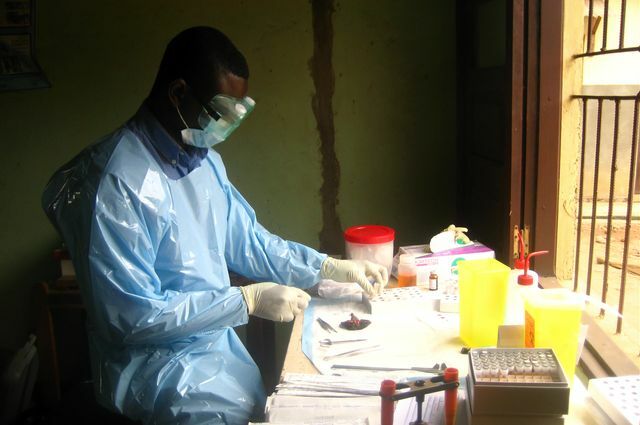 An Ebola researcher works out of a mobile laboratory set up in a mud hut in the Democratic Republic of the Congo. Survivors of the first known Ebola outbreak, which occurred in the Democratic Republic of the Congo in 1976, may be key to development of vaccines and therapeutic drugs to treat future outbreaks, according to a new study led by researchers at the UCLA Fielding School of Public Health. UCLA researchers located the 14 Ebola survivors of the 1976 outbreak who, in January 2016, were still living in the same small, remote villages in the forests of the Équateur Province of northwestern Democratic Republic of the Congo. The researchers obtained blood samples and health history reports from them. The data revealed evidence that these survivors’ immune systems are likely to provide some protection against future infection. The study, published online in the Journal of Infectious Diseases, marks the first time that the effects of the virus have been studied four decades after infection and the first findings that indicate Ebola survivors may be able to stave off future infections. The Ebola virus is often associated with high mortality rates in humans, ranging from 25 percent to 90 percent, and outbreaks have occurred with increased frequency since the first reported event in the Democratic Republic of the Congo in 1976 in which 318 cases were recorded, with a fatality rate of 88 percent. The Ebola virus disease is highly contagious and spreads through direct or indirect contact with bodily fluids. It initially causes fever, headache and muscle aches and can progress to vomiting, diarrhea, and sometimes internal and external bleeding. The 2014-2016 outbreak of Ebola in Western Africa was unprecedented in size and scope — there were an estimated 28,000 cases and more than 10,000 survivors. Rimoin said researchers know there are more than 10,000 survivors of the West Africa epidemic, but they don’t know what long-term health effects those survivors may endure in the future. Their goal, she said, was to locate survivors of the initial 1976 outbreak to learn what happens 40 years after infection. Since no online records of the 1976 outbreak investigation existed, the UCLA team collaborated with and gained access to handwritten notes from three scientists who investigated that outbreak — Dr. Peter Piot and Dr. David Heymann of the London School of Hygiene and Tropical Medicine, and Professor Jean Jacques Muyembe of the Institut National de Recherche Biomedical in Kinshasa. The UCLA researchers traveled to small, remote villages in the forests of the Équateur Province to locate and meet the survivors, and gain access to data. They used a mobile laboratory that was set up in a mud hut to do their work. 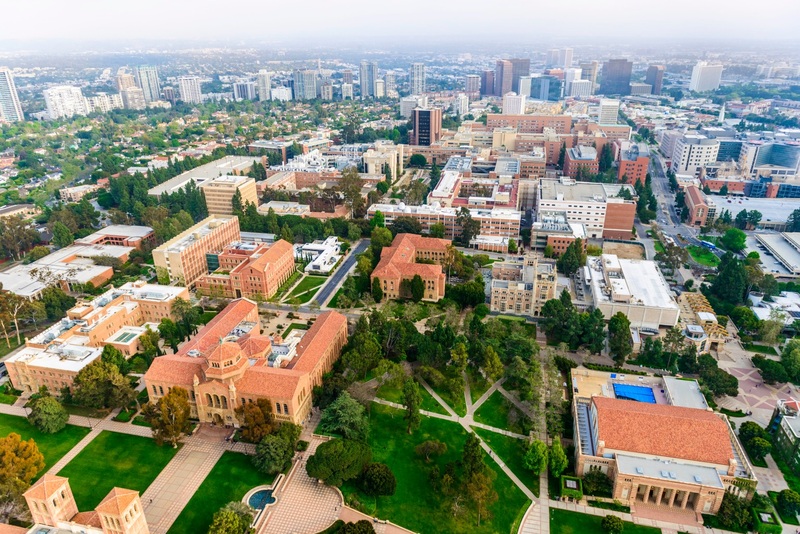 The research was funded by the Bill and Melinda Gates Foundation, Faucett Catalyst Fund, the National Institute of Allergy and Infectious Diseases, a DFG fellowship, the Fogarty International Center of the National Institutes of Health and the University of California Global Health Institute. Study co-authors include Matthew Bramble, Reena Doshi, Nicole Hoff, Vivian Alfonso, Christina Ramirez and Cyrus Sinai of the UCLA Fielding School of Public Health; Patrick Mukadi and Jean Jacques Muyembe-Tamfum of Institut National de Recherche Biomedicale in Kinshasa, Democratic Republic of the Congo; Emile Okitolonda Wemakoy of Kinshasa School of Public Health; and Benoit Kebela Illunga of Direction de la Lutte Contre les Maladies in the Democratic Republic of the Congo.